SpaceX scrubbed a launch Thursday to investigate a “tiny glitch” in an upper stage engine actuator on the company’s Falcon 9 rocket, delaying liftoff from Florida of a Thai communications satellite at least 24 hours. The launch firm said managers delayed the launch until no earlier than Friday “out of an abundance of caution” to review data on the condition of the rocket. The Falcon 9’s upper stage is powered by a single Merlin 1D engine modified with an extended nozzle to fire in the vacuum of space. The powerplant burns a mixture of RP-1 kerosene fuel and liquid oxygen, generating 210,000 pounds of thrust at full throttle. The engine must fire two times to deploy the Thaicom 8 communications satellite into a “supersynchronous” transfer orbit, a high-altitude perch that ranges in altitude from 124 miles (250 kilometers) on its low end up to a maximum distance of nearly 56,000 miles (90,000 kilometers). 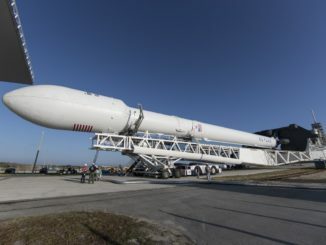 The Falcon 9 rocket was aiming for liftoff at 5:40 p.m. EDT (2140 GMT) Thursday, but SpaceX halted the countdown before loading super-chilled propellants into the vehicle. The launch team hoped to resume the countdown in time for liftoff before the closure of Thursday’s two-hour launch window, but officials scrubbed the launch just before 6:40 p.m. EDT (2240 GMT). 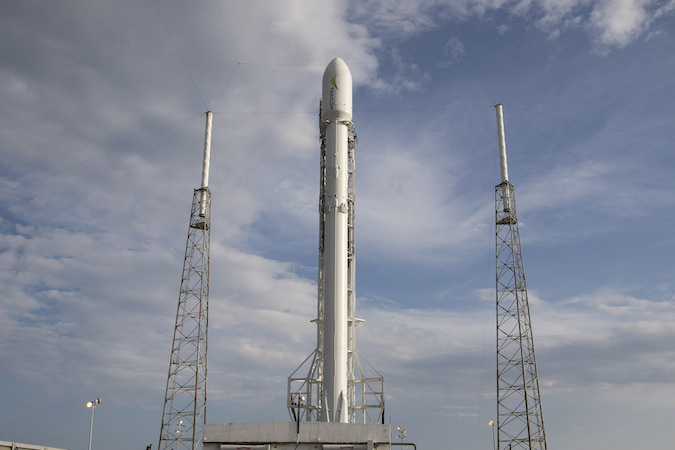 If SpaceX opts for another try at launch Friday, the two-hour launch window will open at 5:39 p.m. EDT (2139 GMT). The weather forecast is significantly worse Friday. Whereas mostly sunny skies were over the Cape Canaveral spaceport Thursday, overcast conditions and scattered showers are in the outlook Friday, when there is a 60 percent chance weather will violate one of the Falcon 9’s launch rules. “The main factor driving weather conditions over the Space Coast during the next few days is an area of disturbed weather forming northeast of the Bahamas,” the U.S. Air Force’s 45th Weather Squadron wrote in a forecast issued late Thursday. “The tropical system will likely slowly strengthen and move northwest, staying east of Florida. Winds will gradually strengthen Friday with the increasing pressure difference between the developing system and the high pressure ridge currently in place. Meteorologists predict scattered clouds at 2,500 feet, broken clouds at 12,000 feet and an overcast cloud deck at 25,000 feet. Winds should be from the east at 20 to 25 mph, and the temperature at launch time should be around 77 degrees Fahrenheit. A slight improvement may be in the offing Saturday, when there is a 50 percent chance of acceptable weather conditions for a launch. When it blasts off, the upcoming mission will be the 25th flight of a SpaceX Falcon 9 rocket since the commercial booster debuted in June 2010. It will also be the fifth Falcon 9 flight of the year, and the second this month. The Thaicom 8 communications satellite fastened to the top of the 229-foot-tall (70-meter) rocket is designed for a 15-year mission broadcasting television programming across Thailand, India and Africa. Orbital ATK manufactured the 6,669-pound (3,025-kilogram) spacecraft for Thaicom, a satellite operator based in Bangkok. 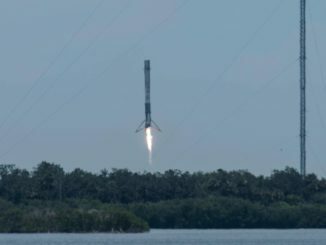 SpaceX intends to recover the Falcon 9 rocket’s first stage after lifting off with Thaicom 8. 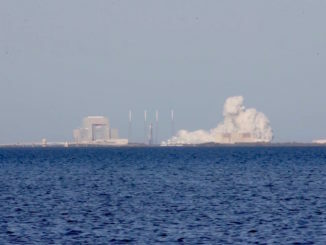 The company’s landing barge is positioned about 420 miles (680 kilometers) east of Cape Canaveral as the company hopes to nail its third booster landing in a row.